Easter - it's more than just chocolate eggs and bunny rabbits, especially when you marry a Catholic. I found out early in my relationship with my wife that for Catholics, and maybe other religions too (I have no idea), Easter is a bigger holiday than Christmas. That didn't much make sense to me at the time, after all what could be bigger than Jesus' birthday? My wife, who is always able to dumb things down to my level, explained it best: Everyone has a birthday, not everyone returns from the dead and therefore Easter > Christmas. Suffice to say that I've been busy the last few days and so this is my first chance to get caught up on the hockey events of the past weekend. 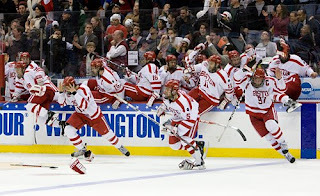 Boston University claimed the national title in an exciting come from behind victory over Miami on saturday night. The RedHawks blew a late 3-1 lead as BU scored twice in the final minute of regulation time to even the score and force sudden death (or sudden victory as I was hearing the politically correct refer to it recently!). Colby Cohen scored the game winner at the 11:47 mark of the overtime. Kevin Shattenkirk made a drop pass at the offensive blueline to set up Cohen who let fly a blast that was partially blocked, but not enough as the puck flipped high into the air eluding everyone before it landed over the shoulder of Cody Reichard and into the back of the net. Cohen could have been the goat because he had taken more than his fair share of penalties during the game but ended up being the hero. Edmontonian Kieran Millan stopped 29 of 32 shots for the win although the broadcast duo of Barry Melrose and Gary Thorne described the goalie as "fighting the puck" and "looking nervous" for much of the game. I felt horrible for Enrico Blasi's club. Miami (of Ohio) has never won a national championship in any sport and here they were less than a minute away from stealing one from the #1 ranked hockey team in the country... only to let it slip away. Failure to convert on their 7 power play opportunities has to be considered the biggest reason why they couldn't get it done. Tommy Wingels played another terrific game for Miami after his big contribution against Bemidji State in the semi-finals. Carter Camper showed he could dangle when he set up the second Miami goal, and Justin Mercier impressed me as well. One last thought on the NCAA final game - thanks to Corey Graham from the TEAM 1260's Post Game Show for texting me after he stumbled across the live coverage of the game on The Score network. I don't know if promoted it at all but if not for the text i would have missed the game and it was a beauty. He was the runner-up on my list two weeks ago but since my own pick didn't make the Hobey Hat Trick, I was pleased that Matt Gilroy took home the award for the top NCAA player. Now that the Frozen Four is over, the Gilroy watch is on to see which NHL team signs the 24-year-old defenceman. The QMJHL is almost down to the final 4 teams. The semi-finals are almost set pending the outcome of the Quebec/Cape Breton series which could conlude tonight should the Screaming Eagles knock of Patrick Roy's Remparts in Game 6. So far the playoffs have pretty much gone as expected with Drummondville sweeping through the first and second round. 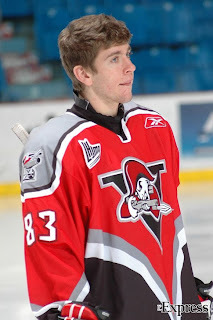 The Voltigeurs will now play the Memorial Cup host Rimouski Oceanic who are a much better team now that they are healthy compared to during the season when they were regularly missing big contributors. The Volts should still be the favored club as they played the fewest number of game possible yet have the four leading scorers in the playoffs. Yannik Riendeau has 28 points in 8 games, Chris Didomenico (pictured) and Dany Massé both have 25 points for Drummondville. Their opponents from Rimouski seem to be getting it done in large part because of their netminder. Keven Veilleux leads them in scoring with 15 points but goalie Maxime Gougeon has the best GAA in the Q playoffs with a paltry 1.78. The Shawinigan Cataractes await the winner of Quebec/Cape Breton and will be the favourite no matter which team they face. 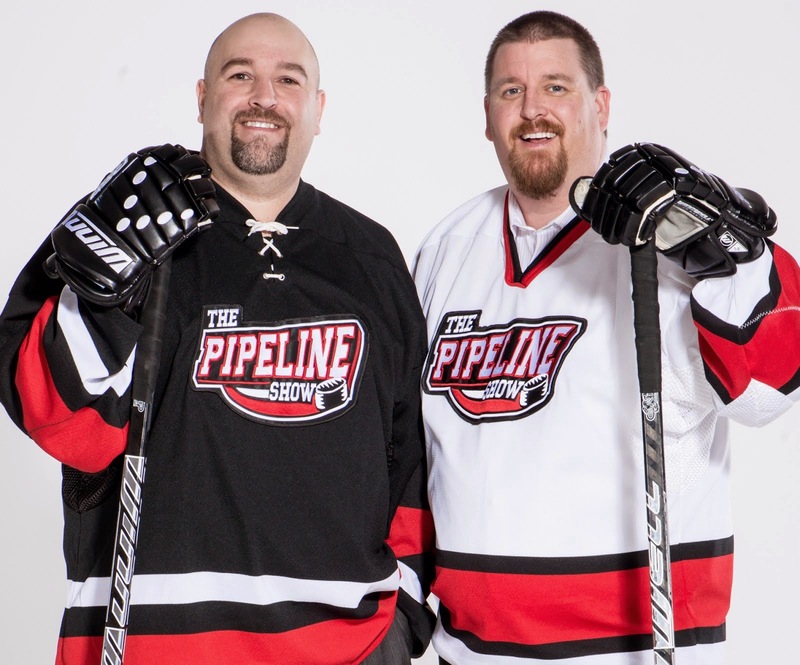 Tuesday night on The Pipeline Show we plan on speaking with someone on the scene covering the Q playoffs so we can get all of the particulars and sidebar stories going on. In Ontario, the semi-finals feature the four teams that pretty much everyone predicted would there. Belleville will face Brampton while the London Knights take on the Windsor Spitfires. Both series begin on Wednesday so all four clubs are benefitting from a nice rest. 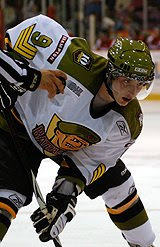 Brampton, my pick to be OHL champs, have Cody Hodgson (VAN), Matt Duchene ('09), Evgeny Grachev (NYR) as well as Thomas McCollum (DET) between the pipes. Belleville counters with Eric Tangradi (PGH), P.K. Subban (MTL), Luke Pither (UFA) and goalie Mike Murphy (CAR). I still like the Battalion. The other series features a pair of teams that will do whatever it takes to win including huge deals at the trade deadline. London's addition of John Tavares ('09) gives them the series marquee players but the Knights also have Nazem Kadri ('09), Michael Del Zotto (NYR) and Phil Varone. My pick is Windsor though thaks to Taylor Hall ('10), Andrei Loktionov (LA), Ryan Ellis ('09) and Greg Nemisz (CGY). Could you imagine if the New York Islanders took Dean's advice and sent Josh Bailey back for the Memorial Cup run too? A couple of weeks ago we spoke with Sam Cosentino of Rogers Sportsnet for his take on the OHL playoffs, we'll speak with another OHL contact tomorrow night on the show. Out west it's been an entertaining post season. The Calgary Hitmen swept through Edmonton and Lethbridge in 8 straight games and arguably had a tougher time with the Oil Kings than the Hurricanes - as much a credit to the OK Kids as a sign that the Hitmen just keep getting better. It's no suprise that the Hitmen have reached the Eastern Conference finals and their opponent isn't really a stunner either although no one expected that the Brandon Wheat Kings would also be a perfect 8-0. The Wheaties cruised past Kootenay and then a battle weary Medicine Hat team to get this far and they've put up big numbers in the process. Brayden Schenn ('09) and Scott Glennie ('09) both have 15 points, more than any Calgary player, and Matt Calvert (CLB) has an even dozen which is equal to the higest Hitmen scorers. The goaltending edge has to go to Calgary's Martin Jones (LA) but Andrew Hayes has been solid for Brandon to this point as well. The Western Conference Final will feature the Kelowna Rockets and against either the Vancouver Giants or the Spokane Chiefs. Spokane failed to close out their series last night allowing the Giants to force a game 7 back home after a 3-2 overtime win. The numbers for Dustin Tokarski (TBY) and Tyson Sexsmith (SJ) are pretty much a saw-off as one has a slighty better GAA while the other's save perentage is a touch better. Casey Pierro-Zabotel (PGH) may have led the league in regular season scoring but he's well behind the postseason race. He has just 11 points thus far, as does Evander Kane ('09). Leading scorer for Vancouver is actually defenceman Jonathan Blum (NSH) with 15 points. Spokane's defensive game has served them well but they need to get more offence out of what I consider to be an underrated collection of forwards. Drayson Bowman (CAR)and Mitch Wahl (CGY) only have 13 points apiece and Ondrej Roman has a disappointing 5 points. Levko Koper ('09) is third in team scoring right now with 10 points but guys like Tyler Johnson, Brady Calla (FLA) and Justin McCrae have barely factored into offence for the Chiefs so far. Meanwhile the Rockets get a nice rest as they await the outcome of Game 7. Jamie Benn (DAL) has been a dynamo and leads the WHL in playoff scoring with 23 points. Recently signed Cody Almond is second in team scoring with 17 points followed by Tyler Myers (BUF), Tyson Barrie ('09), Colin Long (PHX) and Mikael Backlund who missed 3 games due to injury. Tomorrow night we'll be joined by Regan Bartel, voice of the Rockets, who can give us a recap of Kelowna's series wins over Tri-City and Kamloops. 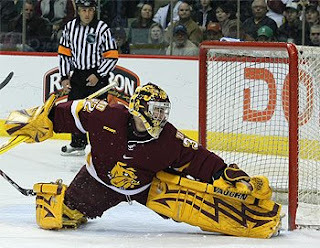 Duluth also lost defenceman Evan Oberg to the Vancouver Canucks. 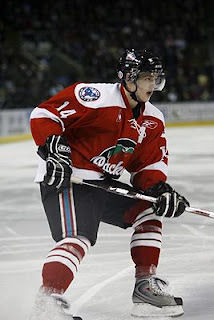 The former Camrose Kodiak went undrafted and spent the last two seasons with the Bulldogs. His offensive numbers jumped from 3 points as a freshman to 27 this past year as a sophomore. The two-way blueliner hails from Forestburg, AB. 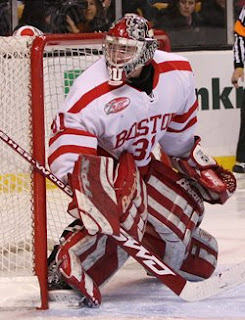 The Detroit Red Wings also signed a goalie taking Notre Dame's Jordan Pearce. Pearce spent his first two NCAA years playing back up to David Brown (PGH) but took the Irish to the NCAA title game last year and was terrific again this year, until the national tournament upset loss to Bemidji State. This could be a very good signing for the Wings but can't be good news for Thomas McCollum. It will also be interesting to see what happens next year with Jimmy Howard and Daniel Larsson in regards to what Detroit does at the NHL level. The Wings have a lot of excellent prospect goalies right now. Dan Sexton, a 5'9 forward from Bowling Green, was signed by the Anaheim Ducks. I don't know anything about Sexton outside of his stats line but it's not bad at all: 21 points as a freshman followed by 39 this past year as a sophomore. Taken in context, he's about to turn 22-years-old, and he's producing as you'd expect someone his age to do at the NCAA level but he's diminutive and on a poor team. Bob Murray found Dustin Penner and some other NCAA unknowns though so maybe this pans out for them down the road. Buffalo just signed Michigan Wolverines senior forward Travis Turnbull. He had a career high 28 points this past year but appears to be a role player of average size and ability. He's appeared in 3 games already for the Portland Pirates but has no points to show for it. Marco Scandella was a 2nd round pick by the Minnesota Wild in 2008 and now he's playing out the year in Houston with the AHL affiliate. The Val d'Or defender had 37 points in 58 games, number that don't scream "sign immediately" yet the Wild are obviously very high on the Montreal native. 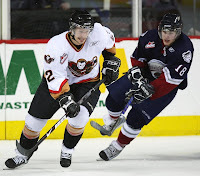 Calgary Hitmen star defenceman Paul Postma was recently inked by the Atlanta Thrashers. That's a hell of a 7th round pick by Atlanta assuming his late development continues as a pro. Postma was arguably the best blueliner in the WHL's eastern conference this year and was probably the MVP for the Hitmen, the #1 ranked CHL team. The New York Islanders signed a pair of prospects yesterday in Mark Katic and Justin DiBenedetto. Katic was a 3rd rounder in 2007 while DiBenedetto was taken in 6th round just last year. 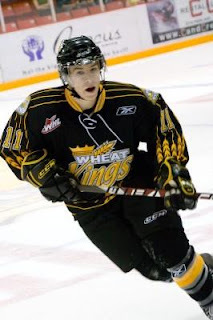 Katic is a small but smooth skating defenceman who played with the Sarnia Sting for four season. DiBenedetto is a winger that also skated with Sarnia this past season. Like I mentioned before, the watch is now ongoing to see who lands Hobey Baker winner Matt Gilroy. I've heard that as many as 24 teams have kicked tires in regards to him although I am also told that Oiler fans shouldn't expect to hear that their team is in the running. I have it on pretty good authority that the Oilers aren't looking at signing undrafted NCAA grads this year.